“Gone Girl” has arrived, and it was worth the wait. David Fincher’s adaptation of Gillian Flynn’s best-selling thriller opened the New York Film Festival Friday night amid great expectations. And, for the most part, those expectations were met. When his wife Amy Dunne (Pike) goes missing and the incident turns into a full-on media circus, her marriage to Nick (Affleck) is scrutinised. But, as the public wonders if he is innocent, it becomes clear all was not well with the Dunnes. A brilliantly complex crime thriller, this excellent adaptation of Gillian Flynn’s bestseller is a truly classy bit of cinema. It may have married viewers looking warily at their partners, but it is also one of the must-see films of the autumn. Everyone who’s read the book will enjoy seeing how director David Fincher has put such a serpentine novel on screen, while fitting some laughs into the dark drama. The screenplay is written by Flynn, who has amended her novel’s structure, trimmed the dialogue and resisted the temptation to throw in a few more curve balls. But the highlight of the film is the ­astonishing performance by beautiful British actress Pike as the clever, ­controlling and determined Amy, the gone girl of the title, whose seemingly perfect marriage to ­foolishly glib and self-centred Nick hides a rather different reality. 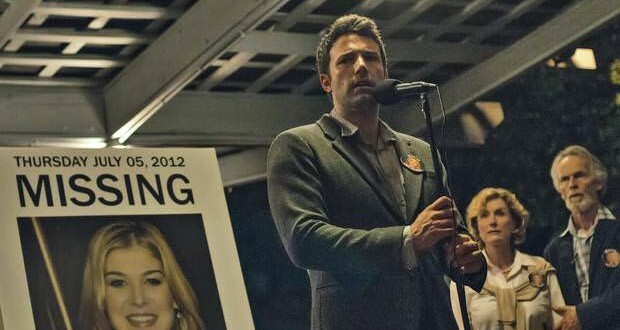 It is a film full of twists and turns so it would be unfair to reveal plot devices, but the clever thing about Gone Girl is how it leads you in certain directions, making you believe certain things about the characters, before turning things on their head and offering new perspectives. While the film is built around the story of a missing woman, at heart it is about a marriage that is gradually shattered and revealed to have deeper, darker layers. There are no full-on thrills here, but rather a smooth and wonderfully compelling crime drama that has you gripped from the start right until its dark climax.